We knew we were respected when Warwickshire decided to field their strongest team in the crucial U15 Shires round. 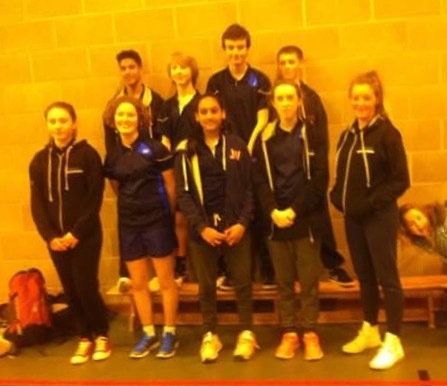 Many of Warwickshire’s U17 regulars were pulled back to the U15 team to ensure they progressed to the playoffs by a win over our ever improving Leicestershire team. And so started the mixed doubles. The first games were all lost by Leicestershire but there was no doubting at this early stage that Warwickshire had to fight for every point! After great encouragement by Eve the fightback started by the spirited partnership and great shots by her and Ryan brought the game to one a piece. Jasmin and Tom C achieved the same result and both pairings had it all to fight for in the final game. Ryan and Eve dug deep and won the final game 22-20 which brought the match to 3-1 to Warwickshire. After a brief but well deserved rest by both teams it was straight in to the singles. This unfortunately saw Ryan withdraw so Tom L stepped up to the plate. Superb play by all players and time after time saw point winning shots by Leicestershire taking the Warwickshire players out of position and then killing the point! Nikhil took his capable opponent to three games which resulted in a Warwickshire win but Nikhil fought gallantly and should be proud of his achievement. The battle of the round was a superb and well deserved win by Izzy taking the set in 2 games. The match was now standing at 10-2. Level doubles remaining and Leicestershire well aware a win was impossible and a draw a tall order but none of these facts detracted the immense effort the team collectively gave and left their all on the courts but no more wins were achieved so the match result was 18-2 to Warwickshire. The team spirit, which has been mentioned numerously was again evident and this result had meant the final game, the following weekend against Derbyshire 2, had to be won 12-8 or better. Well done team and the other counties are now standing up and taking notice as the nucleus of the team still have another year at U15!